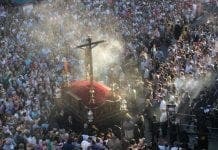 FURIOUS Spaniards are accusing the Roman Catholic Church of seizing more 1,000 public buildings to profit from their use. A Pamplona protest group has released a pamphlet entitled Thou Shalt Not Steal denouncing the church’s actions. A law passed in 1998 allows the church to register places of worship without owning the title deeds. The protesters claim the church is using the law to pocket millions from entrance fees, with some town halls paying the church to return buildings to public ownership. 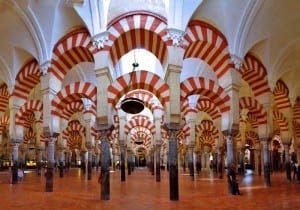 Buildings that have been registered include the mosque-cathedral in Cordoba, the Giralda in Sevilla and the cathedral in Pamplona. The Romans were always nasty little thieves and since it is they that ‘created’ the Roman Catholic church is anyone surprised. The Popes/Caesars did’nt mind at all when they heard about the mass murder and working to death of indigenous peoples in Central and South America – as long as they got a ‘righteous’ percentage of the silver and gold. With all due respect, your comments are in themselves derogatory and incorrect. The Roman Catholic Church was not really created by Romans, rather, Christianity spread to Europe, not just Rome. Rome was the center of civilization for Europe, and so when the Europeans converted the center of civilization recognized this. “Nasty little thieves”, well, that is clearly a subjective opinion and certainly not that of the majority. In fact your statement “nasty little thieves” just shows your own personal bias and says more about you than them. The Pope did not have real power over the Spanish and Portuguese empires – it was more of a mediator between them. If anyone should be blamed for the abuse of the indigenous peoples it should be the Spanish Empire and Portuguese Empire’s leaders – especially the Spanish have a lot to answer for. Additionally, the Pope advocated promoting the conversion of the indigenous peoples so that they could be considered Christians. This then brought them under Christian protection and helped slow the abuses the Spanish were carrying out against the so called ‘unfaithful, who worshiped demons. If you did more research before preaching anti-Roman Catholic rhetoric perhaps you would learn the reality of history – rather than an ignorant and biased version (that is of no use to anybody, save bigots, of course). I am not claiming Roman Catholics or Popes (or Romans or Italians) are perfect, I know they are far from it, but lets not descend into unhelpful name calling – that does nothing other than muddy the waters and raise emotions. Stuart will have fun with this one, but not before I mock the bit about the Pope promoting conversion of the demon worshipers to “slow down the abuses”. They’ve all gone John, converted or not, wiped out by those good Catholics and their priestly advisers. The sooner ALL organised religion, of any stripe, becomes history, the sooner humanity will reach it’s true potential. Stefano, I do not think you read my reply properly. “The Spaniards were committed to converting their American subjects to Christianity and were quick to purge any native cultural practices that hindered this end. However, most initial attempts at this were only partially successful; American groups simply blended Catholicism with their traditional beliefs. The Spaniards did not impose their language to the degree they did their religion. In fact, the missionary work of the Roman Catholic Church in Quechua, Nahuatl, and Guarani actually contributed to the expansion of these American languages, equipping them with writing systems. The 1510 Requerimiento, in relation to the Spanish invasion of South America, demanded that the local populations accept Spanish rule, and allow preaching to them by Catholic missionaries, on pain of war, slavery or death, although it did not demand conversion. Slavery was part of the local population’s culture before the arrival of the conquistadors. Christian missionaries provided existing slaves with an opportunity to escape their situation by seeking out the protection of the missions. Yes this is taken directly from Wikipedia – but it is an easy online reference (which also quotes the sources it uses, unlike you) for what can be found in history books. I guess you will say the history books are wrong and you are right – but you are just a ‘couch warrior’ aren’t you. As regards your desire for a world without any religion, you are entitled to your opinion of course (but the majority of the world disagrees with you). You are probably arrogant enough to disregard the opinions of the majority and insist they ignore their own personal opinions and follow your minority view – totally delusional. They would indeed be cowards if they gave in to your view just because you said so. Real facts too boring for you, lol. Forget reality and go back to bed then Stefanjo. you Catholics of today just don’t get it do you. You Catholics and your Popes have been telling lies for right from the beginning, with the first Papa/Caesar, Constantine being a Pagan right up until the day he died. The Romans persecuted Christians until Constantine tried to ‘use’ Christianity in an attempt to hold together the Roman Empire – that’s not an opinion but a cold stone fact. The Romans looted wherever they went and trying to fulfill the pledge of the Senators that every Roman citizen was entitled to free daily bread actually farmed marginal land in North Africa and so increased the size of the Sahara desert – try reading Plinius if you doubt this fact.Wherever they went they looted, it’s not my opinion and you like nearly all Catholics are riven with denial syndrome, a clear sign of a cowardly personality. Very arrogant of you to claim that Rome was the centre of civilisation in Europe, since the Euskadi and the Celts who inhabited most of Europe were highly cultured peoples with advanced techniques in metal working and farming. You must’nt believe all the propoganda written by biased Romans. Don’t forget it took the Romans 3 wars to defeat the Iberian Celts. Also totally inaccurate that ‘Europeans’ converted to Christianity, neither most of the Celts nor the Aryan invaders adopted Christianity willingly. It was indeed a shock to the Romans that the many of the Gaelic Celts in Erin were Christian. When they did find out they were determined to impose their version of Christianity on the people of Erin and what a bad day that was for the Gaels. The indigenous peoples were’nt converted they were brutalised until they accepted this sick form of Christianity. If they still refused to accept the ‘power of Rome’ they were burned alive. These people did’nt worship demons – you Catholics love your demons don’t you? As for your advice about bigotry and rhetoric – you fool your actually describing yourself. Wow, you are a very rude person who does not know how to have a friendly conversation with people who have a different opinion to yours. You guys would be dangerous, if you were not so clearly ignorant. For your information I am Agnostic, so quite far removed from Roman Catholicism – a word of advice as a qualified lawyer (which is not a qualification they just hand out to anybody, regardless of what you might think), you should not assume things that you have no way of knowing, you end up making very silly yet easily avoided mistakes. What you say is a fact in your reply to me, is actually an opinion (your own personal opinion, albeit that a few others may agree with you) so your intelligence becomes ever more questionable – or you are simply a convoluter of the truth, which brings me back to my previous statement identifying your bigotry and rhetoric. I would have enjoyed a good debate with you, but your disrespectful attitude (and inability to distinguish between an opinion and a fact) would make it all a waste of time for me. I refer you to my reply to Stefanjo above, if it is finally posted, which attempts to correct the misinformation you are trying to spread. Read it, perhaps you will learn something…then again you will probably deny it altogether and continue to promote your fringe opinions (and try to pass them off as facts as well). You can reply to this if you like, as I am sure you are one of those people who feels he must have the final say – do not hold your breath waiting for my reply, as I have already wasted enough of my valuable time replying to you. Have a nice life amigo, but try to be more friendly (it may make you a happier person). Perhaps not something Stuart Crawford is willing to accept, but a (real) fact nonetheless. It is also from Wikipedia I’m afraid, but can be found in authoritative books as well. was he out on day release – it does’nt matter does it. An Agnostic, no a liar. No Agnostic would be as arrogant and abusive as him. All organised religions and politics are a clear manifestation of mental sickness and as can be expected are responsible for all this planet’s problems. Now if they were all rounded up and processed into useful material, like fishmeal,bonemeal and organic nitrogen fertiliser, the seas would be full of fish, crops would be abundant and there would be no over population. Just one more point – is he an American fruitcake, he certainly sounds like one. It´s a fact that the Church have been taking care of the buildings of the churches since many centuries ago . Then to write those register of propierty is a burocratic procedure that in this case not implies the acquisition of a property. So is natural that the Church not be obligated to pay any tax due to increasing of his properties. Equally is another fact that in the times in which the churches are appropriated by institutions different to the Church, those buildings and the artistic treasures that they contain have been completely or partially damaged. The relations between the Church and the spanish kings some times have been stormy, we can remember the Sacco of Roma make for the troops of the Catholic King Charles I of Spain, and the diplomaric contacts made some time before for the Turcs with the Pope for an allegiance against Spain. “was he out on day release” & references to “fruitcake” as a derogatory term – Is that another degrading statement aimed at those less fortunate than you Stuart? You are a horrible self important little man. And I mean little as in small minded and not in stature. If the Catholic church sold all those golden objects and paintings it owns World poverty would end. How they can preach and ask ordinary people to help others less fortunate when they swing a golden dish from a rope and light candles in ornate candle holders while the walls are adorned with all sorts of fabulous paintings worth millions is beyond me. Religion is the ROOT of all evil not the solution. Grrrrr! You are commenting on the wrong thread, stay focused. Are you also disabled, if so you should make this plain but on the right thread. Disabled people should receive all the help possible but reality dictates that there are certain occupations that simply are’nt open to them – what part of this don’t you understand. “You are commenting on the wrong thread, stay focused.” I think not – see your comment ON THIS THREAD at 17 Dec, 2015 @ 14:26 at 14:26. Whether or not I am disabled should not be of any concern over my this board. Your lack of touch with these enlightened times is remarkable. Are you still living upon your past glories (in the distant past) not wanting to admit to yourself that those days are way behind you, leading you to strike out at anyone in the vain hope of scoring pedantic points in order try and feel important and useful in a society that you no longer understand? It appears, by common consent among these views, that the Catholic Church is run by thieving ratbags. Are we all agreed on that? Stay focused people. It´s evident that the religion is old as the humankind , we are speaking a about one of the most important needs of the men. The Word “Religion” in Latin means tied of ties. The world vision of a people needs to be based in a religion. The idea of to considerate the Catholicism – a religion professed for a thousand millions of people- , and fundament of the Western Civilizationas “run by thieving of ratbags” only can be calificated as madness. Or an excess caused for fanatism. Back to the top Anselmo. This thread concerns the sequestration of publicly-owned buildings by the main nationally-approved religion. A less fancy way to describe sequestration is ” theft”. The protagonists, being representatives of this holy organisation, can legitimately be described as “ratbags”.